Originally published in Creation 21, no 4 (September 1999): 28-32. It is clear the elephant is perfectly designed to deal with its bulky frame and weight, and its highly specialised trunk is one of the marvels of the animal kingdom. The majestic elephant is perhaps the best known, and most admired, of the world’s wild animals. Both belong to the order Proboscidea, a name derived from their most easily recognisable feature, the trunk (or proboscis). This trunk is used in a remarkably wide range of activities: it is powerful enough to be used as an extra limb, to uproot bushes and trees and deliver a crippling blow, yet it can also perform actions demanding great skill and concentration. The tip is especially sensitive, comprising a finger-like “lip” able to pick up small leaves and berries. It’s hard to imagine what it must have been like for ancient civilizations catching sight of these imposing creatures for the first time in war. Hannibal, the great Carthaginian general of the third century bc, gave the Romans their first look at the elephant in 255 bc when he defeated the Roman army in the battle of Tunis. He then took the animals onto European soil in 218 bc, including them in the legendary army he marched across the Alps into Italy during the Second Punic War (between Rome and Carthage). The Carthaginians, however, were not the first to use war elephants; they were first used in India, and this use was known to the Persians in the fourth century bc. However, as many of the 38 elephants Hannibal took across the Alps died during the journey, they were soon abandoned as war animals. Elephants live in a wide variety of habitats, from desert margins to savannahs to woodlands and tropical forests to mountainous country such as the slopes of Mt Kilimanjaro.9,10 This ability of the elephant to occupy a broad range of habitat types is largely due to its remarkable design features; notably its trunk. It is clear the elephant is perfectly designed to deal with its bulky frame and weight, and its highly specialised trunk is one of the marvels of the animal kingdom. The elephant today has no known natural predators. This magnificent creature is yet another example of the ingenious design of the Creator. African and Asian elephants, along with now-extinct species such as the mammoth, stegodon and mastodon, are most likely all descended from the one basic “kind” present on the Ark.18 That “elephant” would have contained all the genetic information for the possible species variation to come as its descendants spread across the globe after the Flood. For example, the potential for both large and small ears was in the genetic information of the basic kind. 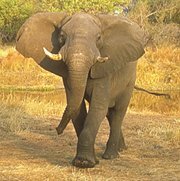 The “culling” of some of this information by natural selection (plus other factors, such as “genetic drift” —chance loss in small populations) resulted in fixed characteristics within each group — sometimes the result of fine-tuned adaptation to the environment (for example, the larger ears of the African elephant).19 In other words, “modern” elephants contain less genetic information than their ancestors. Some of this loss of information is still going on. Because poachers keep killing elephants for their tusks, those with a genetic defect losing (or suppressing) the information for tusks are favoured by selection.20 So, as this defect/loss has spread through the population, more and more “tuskless” elephants have “evolved”. But this demonstrates a downhill process, the very opposite of the “uphill” process (a net gain of information) needed to turn fish into philosophers (or algae into elephants). Many people see mammoths, as featured in “stone age” cave paintings, for instance, as part of a world many tens of thousands of years before the present. The biblical truth about history would indicate a time-frame much closer to the present. Thus it was exciting when some huge live elephants were discovered recently in Nepal, which had the same sloping backs and humped heads as the elephants (mammoths) drawn in the cave paintings.21 This would indicate that the genetic information for these features has survived within the modern elephant gene pool, bringing the “time of mammoths” not only much closer to, but right into, the present. Elephants have long been known to be excellent swimmers22 even to the point of using their trunks as breathing snorkels. Now some Australian biologists are promoting the theory that the evolutionary ancestors of elephants spent millions of years as aquatic animals.23 This of course flies in the face of previously “certain” beliefs about “elephant evolution”. Of course, once such an idea gains momentum, it is always possible to point to other features consistent with it. Thus, it was put forward for a time (and some evolutionists still believe it) that we evolved from an “aquatic ape”. Proponents of this particular “just so story” about “human evolution” could point to things such as our lesser amount of hair compared to apes (for streamlining in the water), the so-called “diving reflex” in the newborn, and more. Those who prefer another story of our ancestry can point to many similar “proofs” that we evolved from an ape on the African savannah. Evidence can always be interpreted in a variety of ways. There is much evidence consistent with the Bible, which makes it plain that neither elephants nor humans ever went through an “aquatic stage”. The difference is that this account is not one invented by fallible human story-tellers, but is recorded for us as the sure testimony of the living God, who made Heaven and Earth. Haynes, G., Mammoths, mastodonts, and elephants, Cambridge University Press, Cambridge, U.K., 1991, p. 3. Haynes, G., Mammoths, mastodonts, and elephants, Cambridge University Press, Cambridge, U.K., 1991, p. 10. Haynes, G., Mammoths, mastodonts, and elephants, Cambridge University Press, Cambridge, U.K., 1991, p. 41. The New Encyclopaedia Britannica, 15th Ed., 4:442, and 23:436–437, 1992. Haynes, G., Mammoths, mastodonts, and elephants, Cambridge University Press, Cambridge, U.K., 1991, pp. 121&8211;122. Haynes, G., Mammoths, mastodonts, and elephants, Cambridge University Press, Cambridge, U.K., 1991, p. 40. For comparison, the longest Asian elephant tusks recorded were 2.7 m, but this was exceptional, because 1.5 m is the more usual upper size limit for Asian elephants. See Haynes, G., Mammoths, mastodonts, and elephants, Cambridge University Press, Cambridge, U.K., 1991, pp. 44–45. The New Encyclopaedia Britanica, 15th Ed., 29:535, 1992. Haynes, G., Mammoths, mastodonts, and elephants, Cambridge University Press, Cambridge, U.K., 1991, p. 58. Haynes, G., Mammoths, mastodonts, and elephants, Cambridge University Press, Cambridge, U.K., 1991, p. 59. Haynes, G., Mammoths, mastodonts, and elephants, Cambridge University Press, Cambridge, U.K., 1991, pp. 35&8211;36. Haynes, G., Mammoths, mastodonts, and elephants, Cambridge University Press, Cambridge, U.K., 1991, p. 11. The New Encyclopaedia Britanica, 15th Ed., 29:21, 1992. Encyclopaedia Britannica, 15th edition, 1992, Macropaedia 28:170–171. Haynes, G., Mammoths, mastodonts, and elephants, Cambridge University Press, Cambridge, U.K., 1991, p. 23. This is not just conveniently assumed for the sake of minimising the numbers of animals on the Ark. Creationists have shown that even if the assumed meaning of “kind” was genus in every case (which would mean that separate pairs of African elephants, Asian elephants, mammoths, stegodons and mastodons would have been taken on board), the Ark could still easily have accommodated them. See J. Woodmorappe, Noah’s Ark: A Feasibility Study, Institute for Creation Research, El Cajon, CA, USA, p. 6–8, 1996. Sarfati, J.D., Refuting Evolution, Master Books, Green Forest, AR, USA, Ch. 2, 1999. Wieland, C., “Lost world” animals —found! Creation 19(1):10–13, 1996. This discovery is now widely recognized, and a video has been made of these creatures in their natural habitat. Merit Students Encyclopaedia, 6:313, 1983. Gaeth, A.P. et al; Proceedings of the National Academy of Sciences, 96(10):5555-8, May 11, 1999. Grigg, R., Ernst Haeckel: Evangelist for evolution and apostle of deceit, Creation 18(2):33-36, 1996; Grigg, R., Fraud rediscovered, Creation 20(2):49-51, 1998.